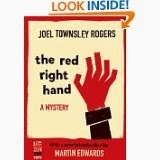 I’m surprised that I’d never heard of The Red Right Hand by Joel Townsley Rogers (published 1945 and now available as e-book) until recently. What a novel! The author runs full tilt at the plot, pulling the reader along with him, and keeps going, the pace never slackening, until finally, finally, he skids to a halt at the end of the novel, leaving the reader breathless and astonished at the audacity of the conclusion. The first person narrator is Harry Riddle, a young surgeon, and the opening lines set the tone of the novel: ‘There is one thing that is most important, in all the dark mystery of tonight, and that is how that ugly little auburn-haired man, with his torn ear and his sharp dog-pointed teeth, with his twisted corkscrew legs and his truncated height . . . could have got away and vanished so completely from the face of the countryside after killing Inis St. Erme.’ What is most worrying Riddle (aptly named!) is the puzzle of how ‘the murder car . . . could have passed by me while I was at the entrance to the Swamp Road just before twilight.’ The killer must have passed Riddle – all the eyewitness accounts confirm it – yet it didn’t. Or so Riddle thinks, for as the novel continues we suspect more and more than Riddle isn’t a reliable narrator. Could he even be the murderer? The novel is like a piece of music in the way that it returns again and again to theme of the disappearing car, adding an extra element each time. The narrative moves back and forward in time, plot twists are thrown in with wild abandon, and yet somehow the writer keeps it all under control. In his excellent introduction, Martin Edwards comments on the ‘torrent of coincidences’ and that’s true, but it’s such bravura performance that one is swept unresistingly along, and I agree with his verdict that it is a stunning novel. It reminded me a little of Frederic Brown’s Night of the Jabberwock (also newly available as an ebook), but only a little. The Red Right Hand is one of a kind and I loved it.